EUR/USD was trading a tight band on Tuesday around the 1.1180 level. Decent economic news from Germany and the Eurozone gave added support to the single currency. 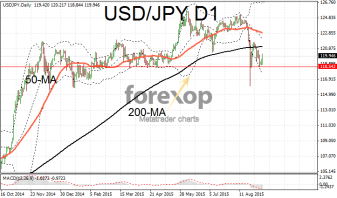 The US dollar was down against the British pound and the euro, but trading higher on the yen. Germany’s balance of trade figures were released today and showed that exports from Europe’s largest economy accelerated in July. Exports increased by 2.4 percent month on month to July, helped by a weaker euro. This was well above the 0.4 percent that had been forecast. This helped lift the trade surplus to a record 22.8 billion euros. Shipments within the Eurozone increased by an annual rate of 5.5 percent the figures showed. Exports outside of Europe grew by a healthy 6.4 percent. Further good news came as Eurostat upped its growth estimates for Q1 and Q2 for the Eurozone. Eurostat revised its estimate for Q2 to 0.4 percent from 0.3 percent. USD/JPY posted another decent gain today rising to 119.97. 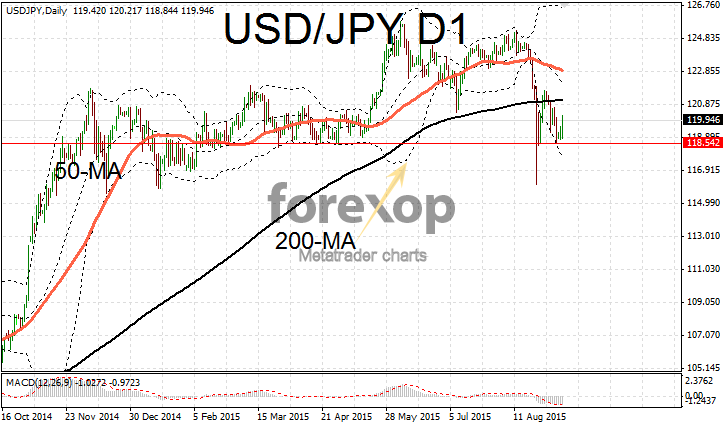 This was broadly due to an outflow of funds away from the yen as risk position is reduced. Volatility levels receded again as traders’ concerns over China took a back foot once more. The day was light on economic news however what emerged was broadly supportive for the greenback. Business confidence rose in August. According to a survey by NFIB small businesses were more optimistic last month than in July. The index rose to 95.9 from 95.4, just below the 96 reading that markets had expected. A separate report showed that labor market conditions improved again in August marking the third monthly rise in a row. The dollar also tracked higher on the Swiss franc moving up into the 0.98 range for the first time in one month. The Swiss franc had pushed the greenback as low as 0.92 late last month as markets turned towards traditional safe haven plays.